Let us roar, stay tuned, LHL! And so LHL accused the WP of being ‘tigers’ ‘during elections’. Oh yes, not just the WP, SDP too, has he forgotten? And we are going to roar, loudly, to the deafening of his ears. Splendid lyrics here to describe our situation in our fight against his PAP! Complain all day about the government, vote PAP in the elections. Like Lee Hsien Loong’s page on Facebook, vote WP, SDP in the elections. Have you heard of Article 5(2A) of the Singapore Constitution? If you have not, it’s important you know. Article 5(2A) was passed in 1991 but has been held in abeyance since. This means that it is not in force yet and hence not binding on the Government. 1. What is Article 5(2A) about? (iii) any provision in Chapter 1 of Part V or Article 93(A). (v) any provision in the Constitution that authorises the President to act in his discretion. Key among the above is Part IV which enshrines our civil liberties including the freedom of speech, assembly and association. The Article also protects the Elected President’s powers particularly in relation to matters relating to the budget. Principally, therefore, Article 5(2A) is designed to safeguard against the potential for a tyrannical or profligate government. Despite the importance of this Article to our democratic narrative, the PAP has again stressed last week that it does not want it to come into force yet. “To bring Article 5(2A) into force before that would otherwise potentially trigger a national referendum each time we needed to make a further refinement or adjustment,” said Shanmugham. As to why the parts pertaining to our civil liberties could not be enforced first, Shanmugham said that “Article 5(2A) comes as a package”. 2. More than Meets the Eye? When one takes a look at laws such as that on Unlawful Assembly which prohibits a gathering of 5 or more persons that violate our civil liberties, one can’t help but wonder if there is more than meets the eye in the PAP’s refusal to enforce Article 5(2A). 3. Should we be concerned? As we all know, Singapore is at most a quasi-democracy in which the PAP has an overwhelming majority in Parliament and has put in place many anti-democratic mechanisms to prevent the Opposition from gaining ground. It has also used various laws like the Internal Security Act to silence and intimidate critics. This means that the Party can do as it wishes with very little accountability. In other words, the potential for tyranny is a very real one. The PAP’s argument that Article 5(2A) can wait while it sorts out the intricacies of increased social spending is flawed because it is predicated on the flawed assumption that its politicians will always act in the interest of the people and respect our civil liberties. Who is to guarantee that in the near future, a Burnese military junta-like leadership would not take control either in the face of perceived or imagined social chaos or out of a desire to go back to the orderly days of Lee Kuan Yew when everyone was cowed by the Patriarch’s absolute power? 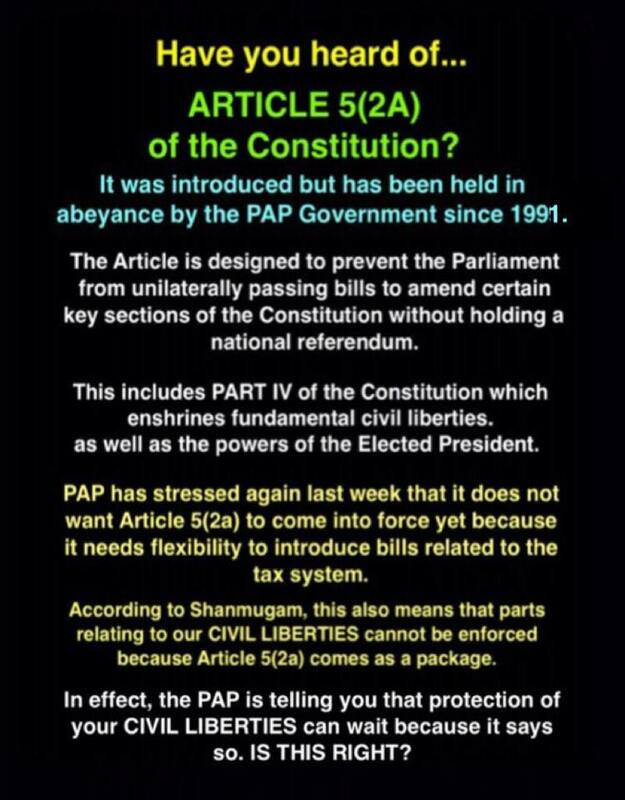 So in summary, the PAP’s procrastination on Article 5(2A) is a threat to the well-being and integrity of our democracy. Then again, we should not be surprised; as history has shown that in its quest for permanent power, civil liberties rank low on the Party’s list of priorities for it makes for complex and complicated politics that it’s technocrats are ill-equipped to handle, as we are witnessing now. 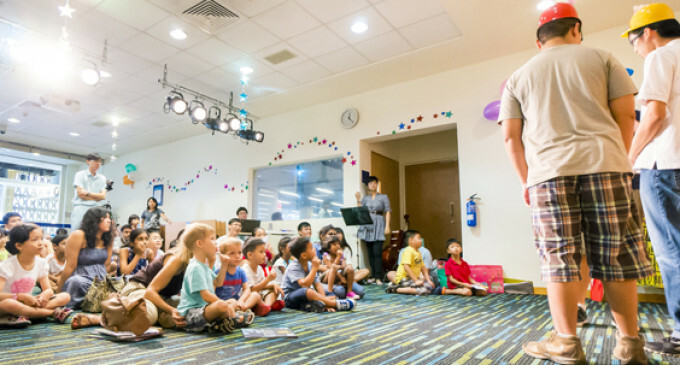 Gwee Li Sui withdraws from keynote speaker post for this year’s National Schools Literature Festival, as he joins Felix Cheong, Prem Anand and Adrian Tan in cancelling their attendance at NLB’s panel discussion today. We reproduce his writeup on his absence. By now, you may have heard that we 4 humour writers Felix Cheong, Prem Anand, Adrian Tan, and I have cancelled our panel discussion at NLB on Sunday. I have further withdrawn as keynote speaker for this Saturday morning’s National Schools Literature Festival. I did not want to have to do this. Therefore, I owe an apology to all the teachers who have put in time and effort voluntarily to run this event. The National Schools Literature Festival celebrates the love of literature as a subject in schools and has done so admirably for 10 years now. This year, NLB has come in as a sponsor. I have deliberated long and hard and concluded that I could not, in good conscience, grace this year’s festival. My presence would have been the symbolic one of a writer. And there was no way I could attend this event without it being misperceived by many that I stood apart from my fellow writers and approved of NLB’s action against alleged controversial books. And there was no way I could defend myself or clarify the festival’s aims fast enough once the suggestion has been made. Stuck in this conundrum, I’ve chosen the kinder of 2 bad outcomes and bowed out. I am a writer, and, as all writers know well, words speak with great power. But, sometimes, the absence of words is also a word, and the word for now is No. No – to read books that do not open our minds is not what reading is about. No – to make others enjoy the books we enjoy and incapable of enjoying what we have decided not to see is not what having books is about. No – to make quick, one-sided judgements about what a book says runs contrary to the nature of books themselves. No – to show that we have no other options than to destroy ideas materially is not what it means to be inspired by words. It really shouldn’t have to come down to this: writers collectively defending the life of books, the knowledge and beauty in them, and what books do. There should have been so many to stand before us, above us: librarians, educators, academics, politicians, parents, children. I am thankful to academics such as Philip Holden and MPs such as Baey Yam Keng who have spoken up, asking urgently for better review processes and for sensitivity in a pluralistic society. And yet here we are still: it has trickled down to us writers to tell you No. What else is there to say? This is the only important word I have left now. In this writeup by former Presidential hopeful, Mr Tan JS, he cites another statistic from the one cited by Mr Jacky Foo, Singapore’s cousul-general in Hong Kong, in response to a SCMP report on Catherine Lim’s letter pointing out the ‘crisis’ of trust faced by the PAP government in the people, which shows Singaporeans’ very low trust in the integrity of our PAP leaders. He pointed out the political ‘sophistication’ of the current citizenry from the one in the past which tended to equate PAP with the government. Additionally, he asked if this could mean imminent change for Singapore in terms of party takeover. When the government responded to Catherine Lim’s open letter to the Prime Minister about a crisis in trust on 13 June 2014, it chose to cite only one major indicator of the 2014 Edelman Trust Barometer , namely the survey result that showed 75% of Singaporeans trust government institutions; this, it claimed, proved that the vast majority trust the government. But a second key indicator gave a different dimension, namely that only 26% of Singaporeans trust their government leaders to tell the truth regardless of how complex or unpopular it is. Does this 26% trust in leaders to tell the truth mean that 74% of Singaporeans cannot trust PAP government leaders to tell the truth or expect them to tell untruths or even lies? Now this is telling. If the statistics are true, it speaks volumes about the low level of trust Singaporeans have in PAP leaders. It is definitely a crisis for the PAP however hard the PAP might want to deny, ignore or gloss over it, not just in its response to Catherine Lim but also in DPM Tharman’s speech to the Administrative Service in March earlier this year. Again, if the statistics are true, this is a crisis of trust in PAP but not a crisis for Singapore. Indeed there is a silver lining for Singapore. In the survey, Singaporeans have made an important distinction between government institutions (which are supposed to be neutral) and government leaders (who are clearly PAP leaders). In past years, most Singaporeans regarded the government and PAP as inseparable and believed that Singapore could not and would not have a functional government without the PAP. Now Singaporeans have become more sophisticated in their view of government and can separate it from the party. Will this increased sophistication give confidence to Singaporeans to vote for a change of party in government in the next general election?